LATEST : We are about to publish the last batch of 75 copies. After that this title will be officially sold out. So if you missed out before this is your very last opportunity. To place an order for one of these copies, visit our on-line shop. They will be printed in March 2018. SIGN UP FOR NEWSLETTERS USING THE BUTTON ABOVE. You can also follow the project on a dedicated Facebook page if you wish. We have a couple more Yes projects in the planning stages, so it is well worth signing up to get first details. LIMITED EDITION : Please note this special large format book is limited to just 580 copies worldwide plus 20 more for the band. Author Jon Kirkman has a track record of working with Yes and various members of the group on a number of important projects dating back some 35 years. In 2013 Time And A Word: The Yes Interviews was published in a high end luxury edition signed by members of the group. Which was fine if you had a deep wallet. The book is now to be made available as a more affordable large format softback edition under a new title: “Yes Dialogue”. It sports a new cover and updated content, and is produced with the full authorisation of Yes and their management (and will be promoted by them through their official website). Over the years in his role as a broadcaster Jon Kirkman has spoken to 16 of the 18 full time members (many more than once) who have passed through the ranks of Yes, and this cache of rare interviews form the core of the book. Jon has also spoken to other people who have contributed to the story, such as Phil Franks, the photographer for The Yes Album, and Roger Dean who designed stage sets for the band and painted numerous now iconic sleeves for the band. 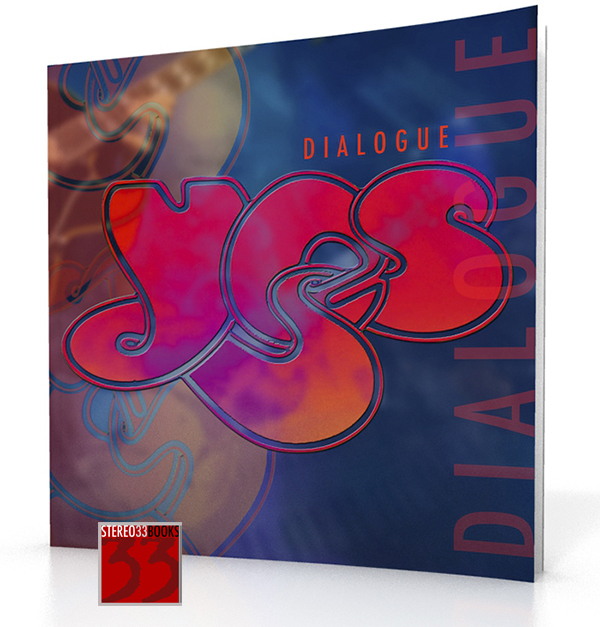 In this updated edition of the book, Jon has spoken to both Chris Squire and Geoff Downes about the latest Yes studio album Heaven and Earth and again to Roger Dean about the artwork for this. He has also tracked down Robert Hagger and Clive Bayley for a chat, founder members of Mabel Greer’s Toyshop, the band which evolved into Yes in the summer of 1968. Add to this all the memorabilia and dozens of rarely seen photographs, and you will see why this book was described as a “must have” for Yesfans the world over. This edition was first published in March 2017 although the run has been done in sections for logistical reasons, and the final run is in March 2018. To keep up to speed on news and future Yes titles, please join the mailing list using the button at the top of the page. Can’t wait! I’m sure it will be cracking. What will the retail price for this edition be? Any idea for a release date? Thanks! Looking forward to it. This will happen fairly quickly Kevin, hoping for July publication. Keep an eye on the site for updates. Best of luck with all of your publication details and progress to shipping this Yes book soon. Hi folks, when is the book supposed to be shipped ? Thank you. We are looking to ship this November time if all goes well. Is the book coming out? The most recent update on this site is from two months ago. Seems like an author and publisher would both be telling their prospective buyers a bit more about the eventual availability. I’ve got my credit card ready, where’s the book? Hi!…i had 13 years old , when i listen for the first time one album of Yes …Fragile…i follow the yes band…but after Relayer… the album and the next after…i forget the title …sorry. In 2007, i buy a computer and ..on yutube..i listen and watching the songs from all the albums Yes realize, sure my favorite are all the first albums…. .but now i am on facebook and about 20 years…i am a big fan of the Tamil movies and the Tamil song and Hindi too, the majority Indians ….Tamil and Hindi…and more… i am the only Quebecois on the Indian site except on African and an other come from the country Chili. Last weekend i painting for my friends and my Tamil are my favorite in my heart. i post the album Tale from topographic ocean…and a Like from a Tamil friend, that nice…!…i am now an personality i had contact there…the actor Ajith Kumar talking with me…and now my all friends on facebook know, i had conversations with him…about 2 week ago.But…i am interesting hear you new song with the band you formed now….Yes are for me a band i listen againt he songs …all the best for the future of YES BAND….!!! Very much looking forward to the release of this book. Many thanks for the care and attention going into this project as well as the updates. Finally a book that’s dedicated to the story of one of the best progressive bands in the world. I’ve bought 2 books please Simon let me know when they are coming. I know what you mean the best part is having my name in the book.